At Paradise Lawn & Landscape we provide the best lawncare and landscaping services in Overland Park and surrounding areas. When it comes to lawn mowing, fertilizing and weed control, we’ll make your lawn look its very best. 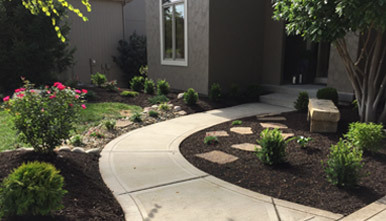 We also offer landscaping services from grading to seeding and sodding to tree and shrub installation. We excel at hardscaping – adding patios, retaining walls, walkways, driveways, and outdoor kitchens. No matter what you need to make your lawn your own little piece of paradise, we have the skills and services to provide it. Call us for any of the following services: Hardscaping, Landscaping, Irrigation, Full Service Residential Lawn Care, Full Service Commercial Lawn Care, and Snow Removal. We love creating pieces of paradise for homeowners. Whether your idea of paradise is a hammock suspended over a pristine, thick green lawn or a complete outdoor kitchen to entertain friends, we can create it. 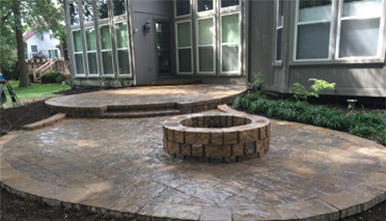 Today’s trend toward outdoor living has given us the opportunity to create beautiful paver patios with built-in fire pits, surrounded by sitting walls and beautiful landscaping as the icing on the cake. We’d love to create your idea of paradise in your backyard. One of the things our customers really like is our 3D CAD designs. If you’re planning a patio, or maybe an outdoor kitchen, we can help you design it and see what it will look like before we ever break ground. It’s a great tool that helps us ensure that you get exactly what you want when all is said and done. Excellent customer service is our ongoing goal and our computer assisted designs are just one tool we use to achieve it. At Paradise Lawn, we pride ourselves on excellent customer service. 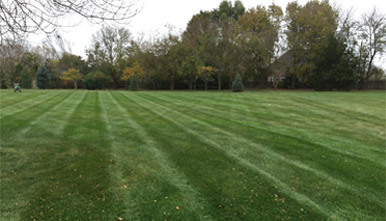 You can expect professional service from experienced lawn professionals with decades in the business. Our employees wear shirts with our logo, are always courteous, and never smoke on the job. We want to bring you the best lawn and landscape and the best customer service all in one package. Paradise Lawn & Landscape is about serving you, our customer. Paradise is the best choice in lawn care. With our dedicated professionals, we guarantee to deliver a quality service that is held to your highest expectations. Join and be apart of the paradise family!